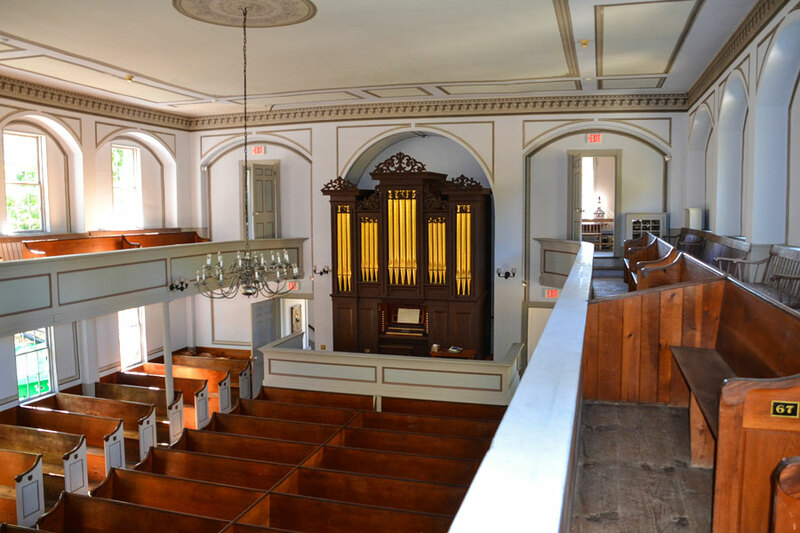 The Shirley Meeting House organ, a gift of Mrs. Henrietta Whitney, was built in 1847 by George Stevens of Cambridge, Massachusetts. 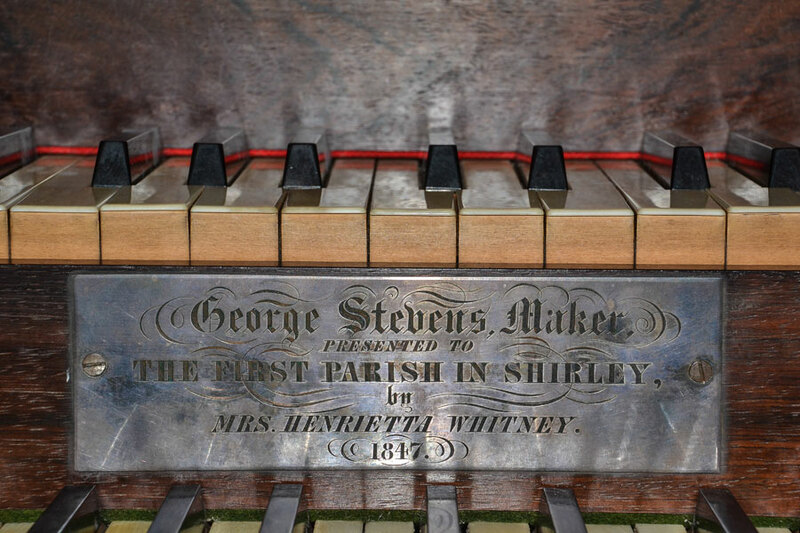 Although not considered to be “style leaders”, Stevens organs were made of fine materials and exquisite in their construction. 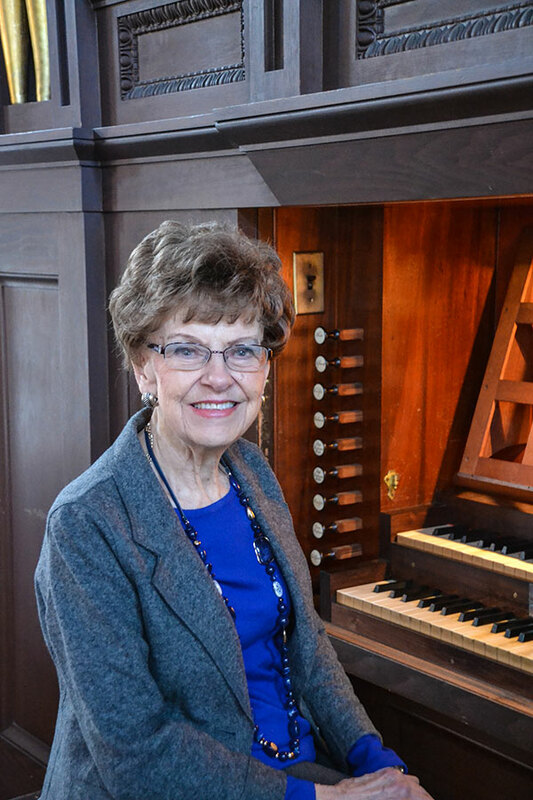 In 1962, cabinet-and-instrument-maker Douglas Brown renovated the organ, maintaining its original qualities. The Andover Organ Company later made repairs to the front pipes. 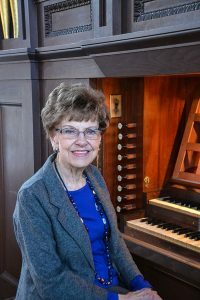 More recently, George Bozeman, Jr. retuned the organ to the old English “modified-meantone temperament”. The Steven Tracker Organ preserves the archaic peculiarities of English organs built during the first quarter of the 19th century. The keyboards of this organ have unusual compasses. The manuals’ lowest note is a GG, two and a half octaves below middle c’ and there is no low GG#, a typical omission of this period in American organs. The highest note is f3. The Pedal keyboard also starts at GG, does include GG#, and has only one octave of notes and pipes. Obviously, because of its short and unusual compass it is useless for normal Pedal parts such as in a Bach Fugue. Use it instead for pedal points and at cadences. This organ can still be pumped by hand, and you should experience this if possible. If you are fortunate enough to have someone willing to pump while you play you can easily imagine yourself living a century and a half ago. Since the organ is tuned in an old-English modified-turning, instrumentalists may have difficulty tuning to it. Allow a trial before committing a soloist to a program.